The stars of the upcoming fantasy/superhero flick "Hellboy" took to the red carpet in New York Tuesday for a special screening of the film. The popular Mike Mignola comic book series has been reimagined for the big screen once again, 25 years after its debut issue was published. The R-rated horror action-fantasy film stars David Harbour as Hellboy, the half-demon superhero and Milla Jovovich as Nimue the Blood Queen, a resurrected ancient sorceress hell-bent on revenge. Daniel Dae Kim (Major Ben Daimio), Douglas Tait (Gruagach, a hog-like fairy creature), and screenwriter Andrew Cosby were among the attendees at the Lincoln Square theater in New York City for the red carpet premiere. Harbour, who many fans know from his role on the Netflix hit "Stranger Things," professed his love for the "Hellboy" comics since his early twenties. In a speech before the screening, Harbour thanked Mignola for his "true genius," without which "none of us would be here." Harbour also spoke about his unconventional methods for preparing for the role, including improv and musical theater classes in Los Angeles. Some of his improv even made it into the movie. He also thanked Joel Harlowe, the special character and makeup designer. "The brilliant Joel Harlowe applied KY jelly all over my body at three in the morning every Monday morning. So you're welcome Joel," Harbour said. Harbour shared the one thing he wants fans to know about this take on the franchise. "We are going to the source material and we are pulling a lot directly from the Dark Horse comics. The color palette is a lot darker and also it's really more of a horror-y sort of almost heavy metal movie in a certain way," Harbour said. How dark is the film? Well, Hellboy must choose between saving the humans that have always rejected him or joining Nimue in triggering the apocalypse. 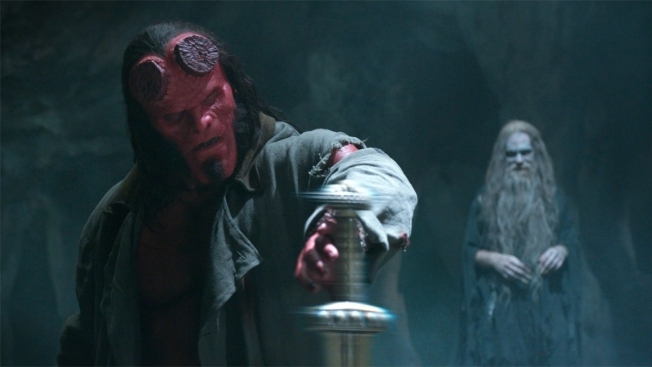 Douglas Tait, who both acts and serves as a stuntman in the film, believes "Hellboy" stands apart from other traditional comic book heroes in a significant way. "A lot of the other superheroes are loved by everyone and he's actually hated even though he's doing good," Tait said. "He's discriminated against because of the way he looks and where he comes from. And he's got this dry sense of humor that's so different from any of the other comic heroes." Screenwriter Andrew Cosby was a huge fan of the comic series long before getting to work with creator Mike Mignola himself. "Half the working relationship was just oohing and aahing over getting to work with someone I consider to be a master of his craft." "He let me explore the character in my own ways, but at the same time was always there as a bit of a safety net to make sure I didn't go too far," Cosby said. "And there were plenty of times where I'd be like, 'Hey Mike, would Hellboy say this?' or 'Would Hellboy do that?' Having that when you're making a movie is priceless." Cosby's first iteration of the script was in 2015, but he feels the film came together pretty quickly. For fans of the previous "Hellboy" film by Guillermo Del Toro, Cosby says fans shouldn't feel that they have to forget about that film to love this one. "I was a huge fan of the Guillermo movie and that's part of my love for the character. I think the guy is beyond a genius," Cosby said. "And so I would just say to come watch this movie because it's something different and it's more. It's more of the thing you already love. It may not be exactly what you want to see or what you thought you were going to see, but I guarantee you, you're going to have a good time and you're going to love what you watch." "Enjoy the crazy fun, horror romp, monster superhero extravaganza that is 'Hellboy,'" Harbour said. "Hellboy" hits theaters on Friday, April 12.